"How I Met Your Mother" may have fallen a little short with comedy this season, but the show's more than made up for it with emotional arcs. Monday night's episode, with the second appearance by John Lithgow as Barney's father, was a great example of that. There were some great laughs to be sure, especially the "Who's on first?" homage in a discussion on nightclubs ("'Oh No' shut down;" "'Closed' is closed") and the cast singing the show's theme song, but the scenes between Lithgow and Neil Patrick Harris were by far the highlights. It was quite a kick to see the old, hard-partying Jerry (with young Barney declaring something "leden-Jerry"), in contrast to the man he is today. I wasn't sure if Lithgow, beyond the obvious cachet from his recent Emmy win for "Dexter," would be right for the part, but this week, I was sold on him. He played both characteristics of Jerry (even if one was just a show for Barney) perfectly. As for the other plotlines, the whole "Marshall and Lily pretending to be in an open relationship" seemed like it was a lot funnier on paper than it was on the show. Surprising too, since they're usually one of the best parts of most episodes. And although we know that Ted and Robin won't end up together, that doesn't stop the writers from revisiting their relationship once more. We also know that Robin's crush is destined to at least run into her again, but I can't help but feel that they're also teasing us on a reconciliation with Barney, as well. Really, it can't get more obvious than Barney saying, "Deep down, you know you were never happier than when you were with her," while imitating his father. In any case, between Lithgow and Harris, they both have pretty convincing arguments for Emmy nominations this year. So, what did you think of last night? Are you enjoying Lithgow too? 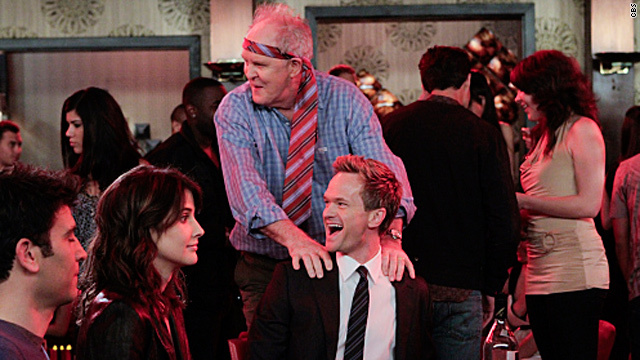 Who do you think is going to eventually end up with Robin (and Barney)? Share your iReport or comment below. Next entry »Elizabeth Banks to join 'The Hunger Games'? yes that big PURPLE dinosauer! Jonn Lithgow and French Stewart used to mushroom stamp each other offset a 3rd Rock. My kids LOVE Barney ! I can set them in front of the tv and they will watch all afternoon ! If it wasnt for that wonderful purple dinosar i would never get anything done ! Man... I miss Lithgow, haven't really seen him in anything since 3rd Rock from the Sun. Children shouldnt be allowed to watch Barney as he is a gay dinosaur.